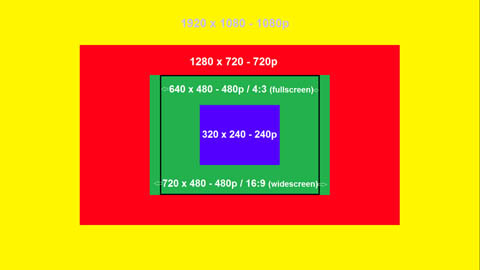 The term “240p” describes a resolution of approximately 320×240, displayed in progressive scan (scroll to the bottom of this page for more info on resolution). The number represents the format’s vertical resolution, followed by a letter indicating progressive scan or interlaced. Alternatively, “480i” would describe a signal that has 480 vertical lines (such as 640×480 or 720×480), that was interlaced. Progressive scanning is when all the lines of each frame are drawn in sequence. This is in contrast to interlaced video where only the odd lines, then the even lines of each frame are drawn alternately. As a result, interlaced video can result in a blurry or shaky image, regardless of resolution. Now that you know what 240p is, how does it work with the various cable formats? Composite, S-Video, RGB and component are the most common methods of getting a signal from your pre-HD (HD defined as 720p & up) game console. Composite, S-Video and RGB can carry both 240p and 480i signals (and as described in the RGB Introduction section, RGB is the best of those methods). Component video can transfer those, plus 480p (as well as 720p and 1080i, but those aren’t relevant for this discussion). As a side note, all HD consoles can output in HDMI and that’s by far the best method for those. I didn’t include these details in the “RGB Introduction” section, since it only matters for people in certain scenarios. But why is 240p important and how can I use it? So, now that you know what 240p is and which cables support it, why is it important? The short answer is because it’s progressive scan. If you run into a scenario where you have a choice between 480i and 240p, your game will almost always look better in 240p. Even though the resolution doesn’t have as many pixels, the progressive scan image won’t flicker and as a result, will look sharper. You’ll only run into a “480i-only” game with 6th generation game consoles, such as the Dreamcast, GameCube, GBA, PS2 and a few rare occasions on the Wii. All “classic”, (5th generation and earlier) video game consoles will almost always output 240p and all HD systems offer 480p and above. Not many games on 6th generation consoles offer native 240p output, however many offer 480p. As a result, I strongly recommend using these systems with a display that supports 480p. In my personal opinion, many of the games for these consoles look better on an HDTV than a SDTV or RGB monitor anyway. If you’re using an upscaler with your 6th generation consoles, try your best to use the game’s progressive mode, but if you’re stuck with 480i, the upscaler will most likely make the image good enough. If you’re using a display that only supports 240p and 480i (such as many RGB monitors), then you may want to look into hardware conversion options. First and foremost, before spending a lot of money on hardware, try playing the game in 480i. Maybe it’ll look fine, or maybe you won’t run into that scenario often enough to justify the cost of more hardware. 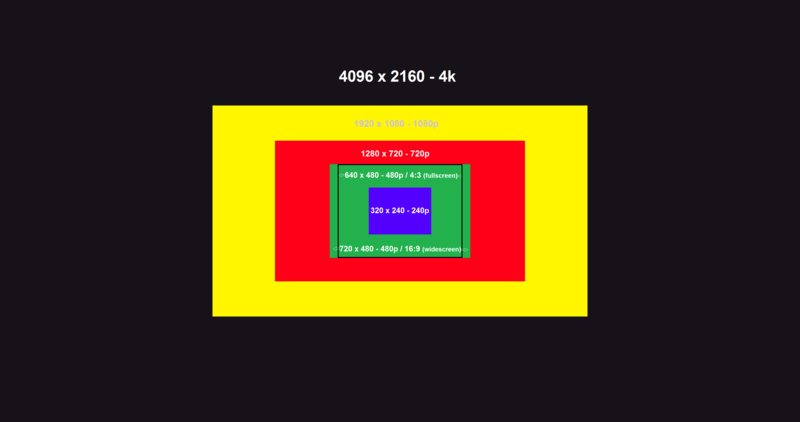 1080p via 240p x4 = 960 – Most TV’s will scale the image to 4 times it’s original resolution and then stretch the image to fill the top and bottom of the screen. This has many negative side-effects and generally results in a bad picture. Some video processors can add black bars to the top and bottom of a 4x scaled image, resulting in the perfect aspect ratio and a good quality image. 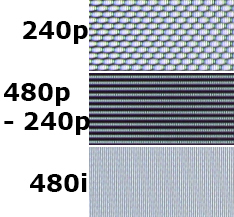 1080p via 240p x5 = 1200 – Some video processors can stretch the image 5 times, cutting off part of the top and bottom. In many cases, this will actually be a good result! I’ll only add one comment to Fudoh’s page: 480p to 240p is easy to do and the results are amazing, but 480i to 240p is tricky and I’ve only gotten it to work in one specific scenario. He explains how to do it, but it’s not guaranteed to work on every display. When comparing horizontal test patterns, you start to see the difference. Keep in mind, much of this is a result of the Emotia, since it only downrezzes the vertical resolution making it 640×240. You can use a Genius II box (as discussed on Fudoh’s site) to downrez both horizontal and vertical resolutions, but each device has its own advantages and disadvantages. It’s my opinion that downrezzing to 240p has many advantages, but getting native 240p output is always the best option. I still use this method in many scenarios: When using a stock GameCube/Gameboy Player, GBA games look much better when outputted in 480p VGA from a GameCube, then downrezzed to 240p! Also, when I play my Dreamcast on my RGB monitor, I personally think it looks better downrezzed to 240p, then in flickery 480i…but most of the time, I prefer to just play my Dreamcast in 480p on my HDTV. I’d like to someday update this this page with a 480i – 240p picture, but I need to find compatible equipment first. I hope this page was a help and not too confusing. If you’re interested in other retro-awesomeness, I invite you to check out the main page, as this site has plenty of other pages you may be interested in.